More than two years overdue, Norway and Russia sign the agreement that will allow them to map oil and gas resources in joint borderlands. The agreement was signed on Thursday as Russian Minister of Natural Resources Dmitry Kobylkin arrived in Oslo for meetings with Norwegian counterparts. It will allow seismic vessels from both countries to cross the borderline and sail up to 5km into neighboring waters. «This means that both counties will be able to improve their mapping of the resource potential along the delimitation line,» says Norwegian Minister of Petroleum and Energy Kjell-Børge Freiberg. 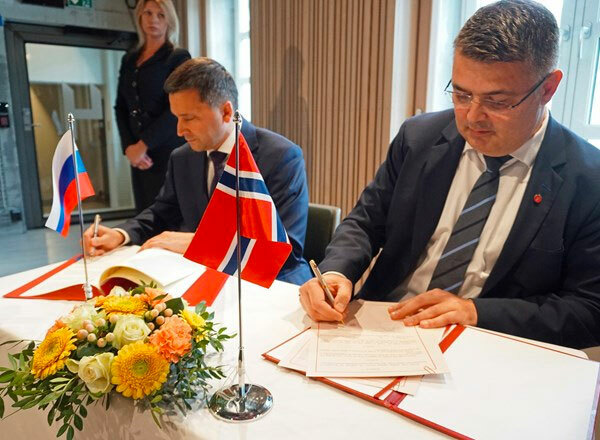 Both Norway and Russia are now in the process of mapping the resources on their respective sides of the border and the new agreement make sure that both countries can get the seismic data they need, the Norwegian Ministry informs. The deal is seen as a natural extension of the border delimitation deal with Russia signed in 2010 and ratified in July 2011. It came after decades of talks and split a 175,000 square kilometer area into two equally big parts. The delimitation deal was followed by a quickly expanding hydrocarbon exploration in the area. On the Norwegian side, new exploration acreage has been made available to oil companies, including directly along the border. A big number of Norwegian licenses have been issued in the area, among them license PL858 which is located directly along the border and will be operated by Norwegian company Det Norske (40%) along with Lukoil (20%), Statoil (20%) and SDØE (20%). On the Russian side of the border, state company has secured control over vast acreage, including the Fedynsky, Tsentralno-Barentsevsky and Perseevsky license areas.